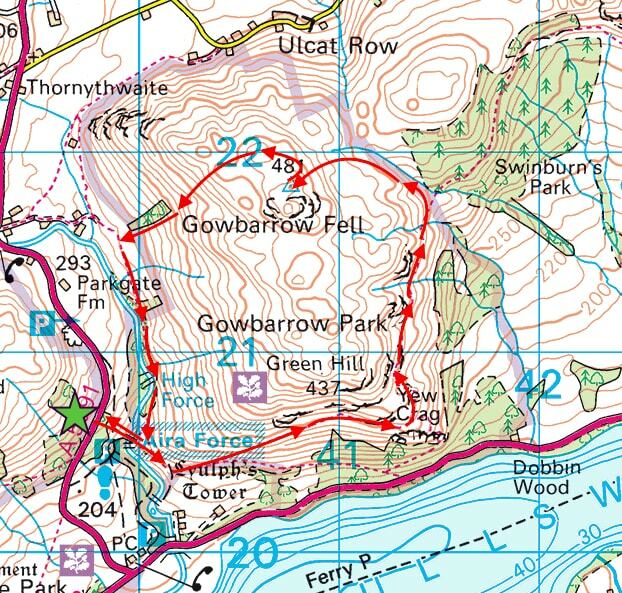 There were things to do this morning so we took a short walk up Gowbarrow Fell to take advantage of the fine weather this afternoon. 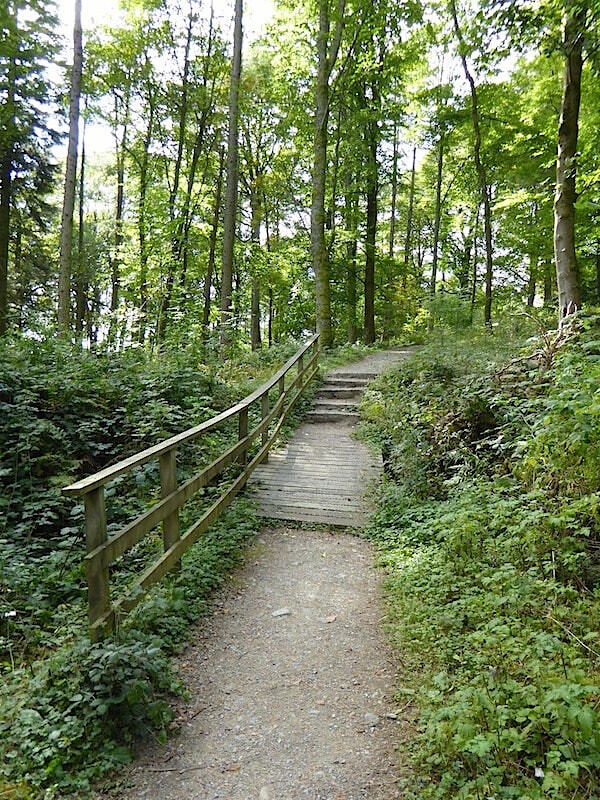 We parked on Park Brow and followed the forest path down to Aira Force. 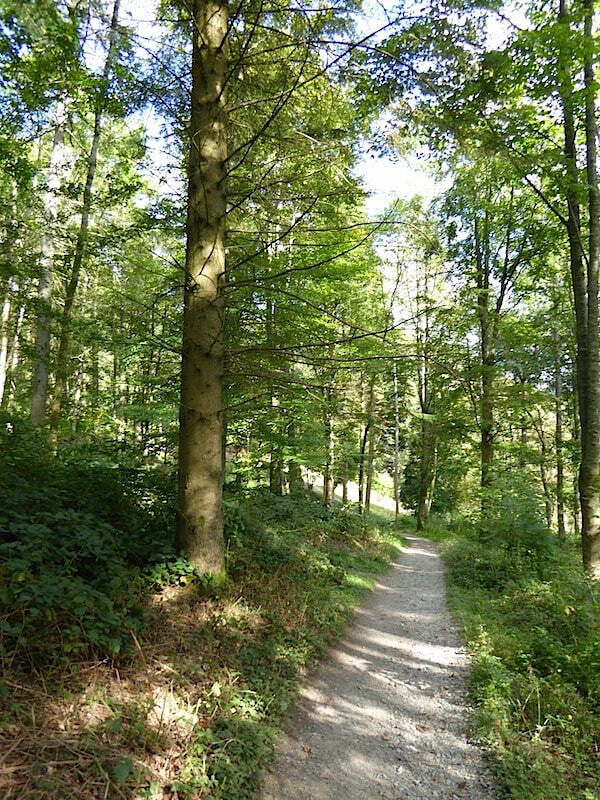 Looking back along the pleasant woodland path. Not many people around today, its Monday so folks are back at work and the youngsters are back at school. Lots of similar notices everywhere, keeping young explorers interested as they walk around. 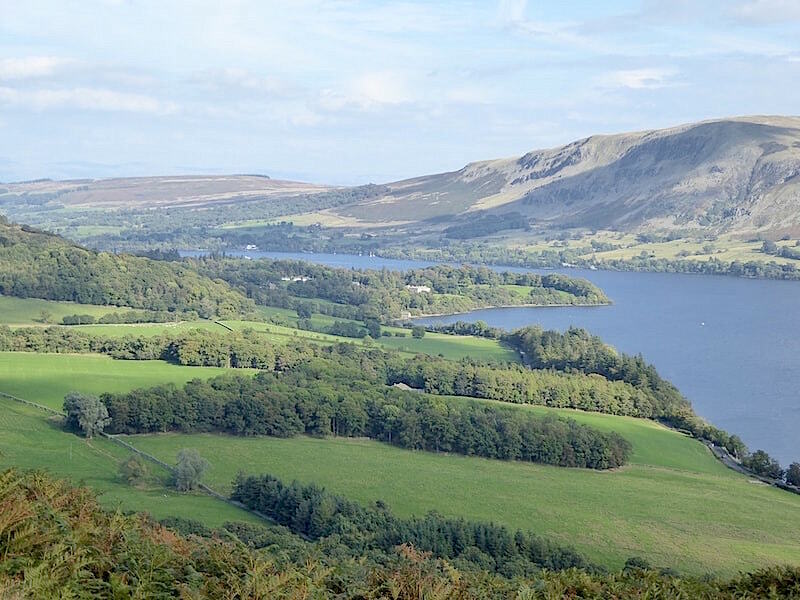 Most visitors don’t take the walk up to Gowbarrow summit, but even if they only walk the forest and beck paths there is plenty to keep everyone’s interest. 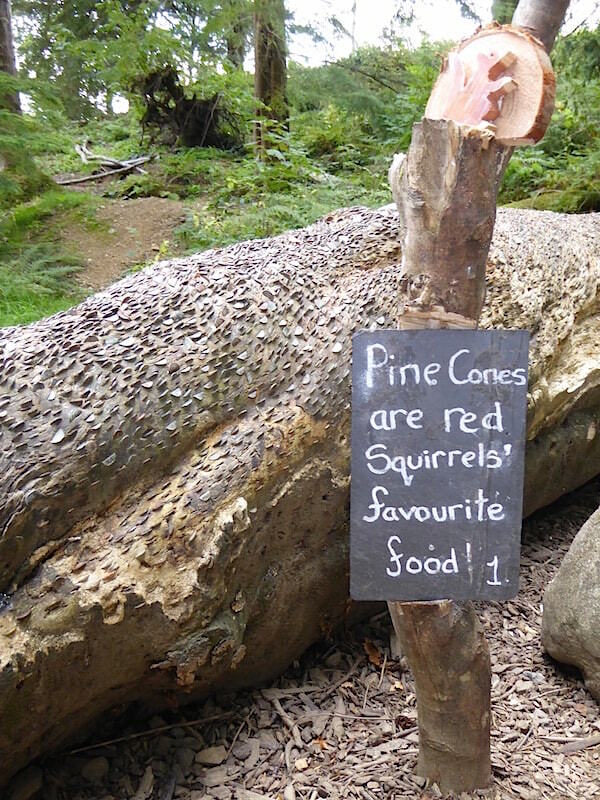 Its an ideal place for a family visit. 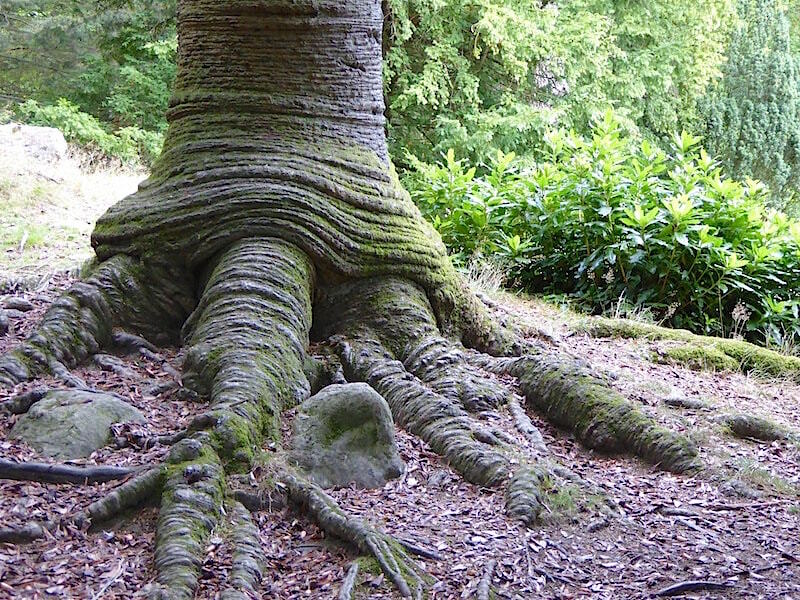 Its only the base of a tree, generally known as the monkey puzzle tree, or to give it it scientific name, Araucaria araucana. Apparently the common name alludes to the fact that the task of climbing the tree, with its sharp branches tightly clothed with spiny leaves, would puzzle even a monkey. From this angle it looks like the foot of some giant prehistoric creature and you half expect to see it hungrily looking down at you. 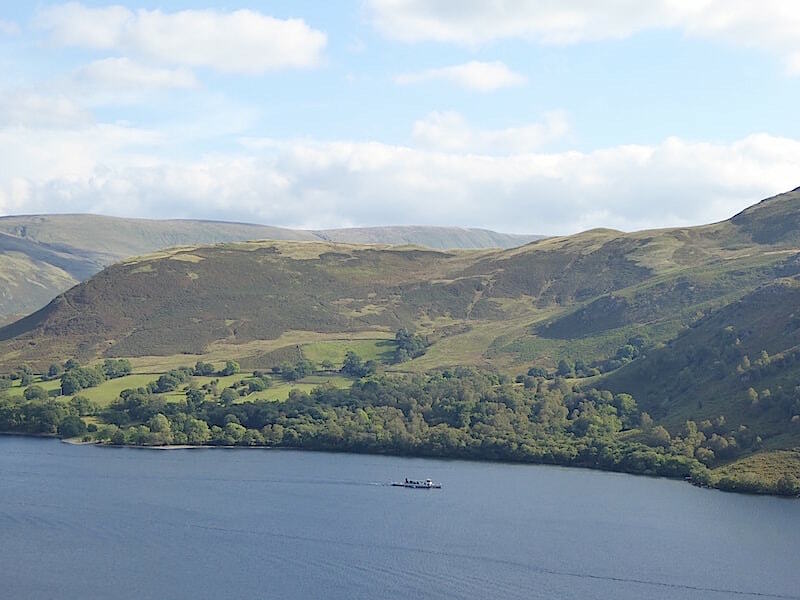 Looking across Ullswater to the lower slopes of Place Fell. 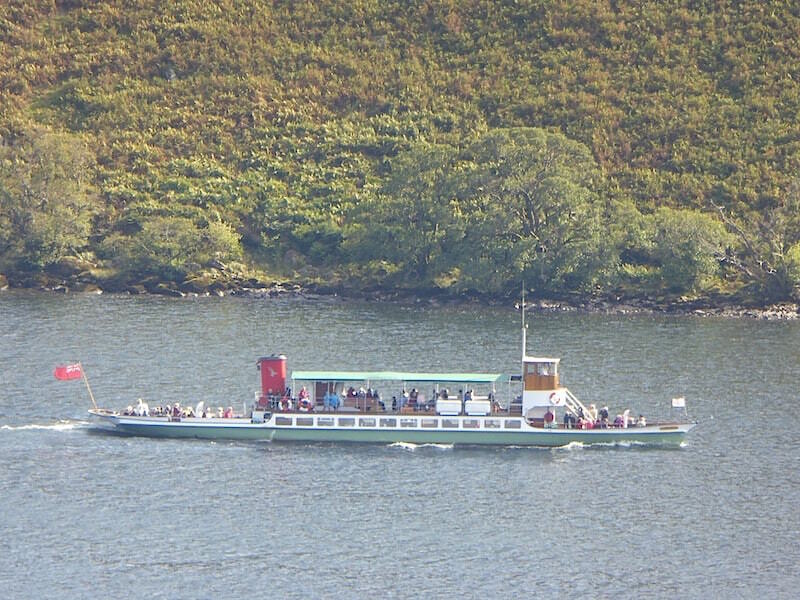 A close up of the Ullswater ‘steamer’ seen in the previous picture. Everyone refers to the ferries as steamers although they are no longer steam driven. That doesn’t matter though, its still great fun to take a trip on one of them. 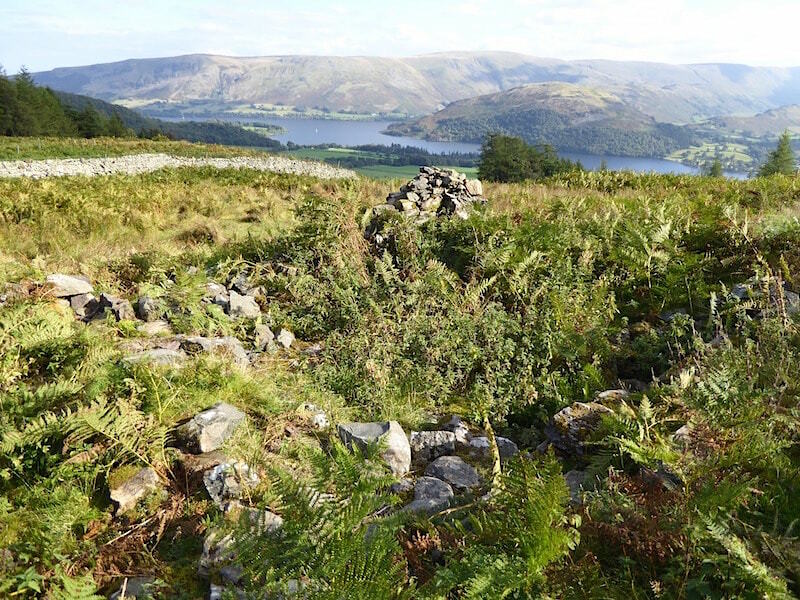 Looking across to the Far Eastern Fells from the terrace path on the slopes of Gowbarrow Fell. 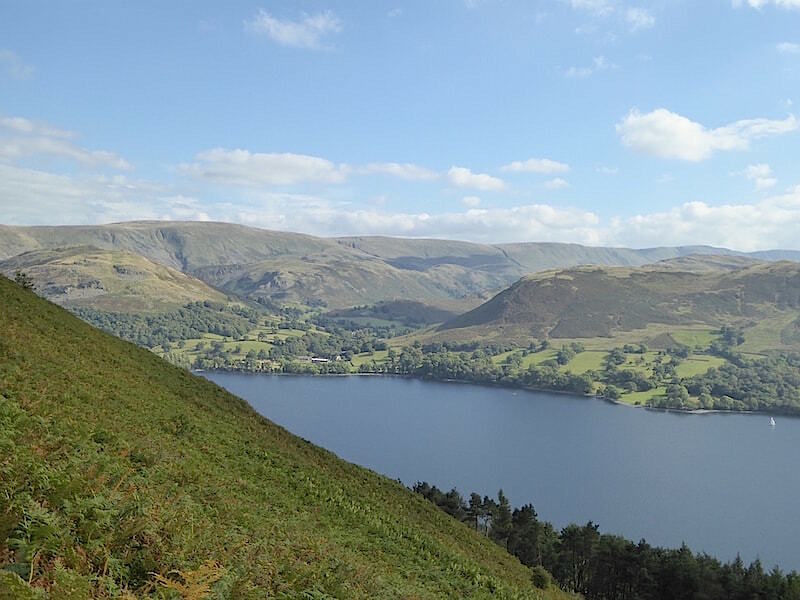 Looking up to the Glenridding end of Ullswater. A close up of the back of Lyulph’s Tower. From the front it looks more like a castle but that’s just a facade as you can see. Its on private land so its not easy to get a good view of the front of the building. 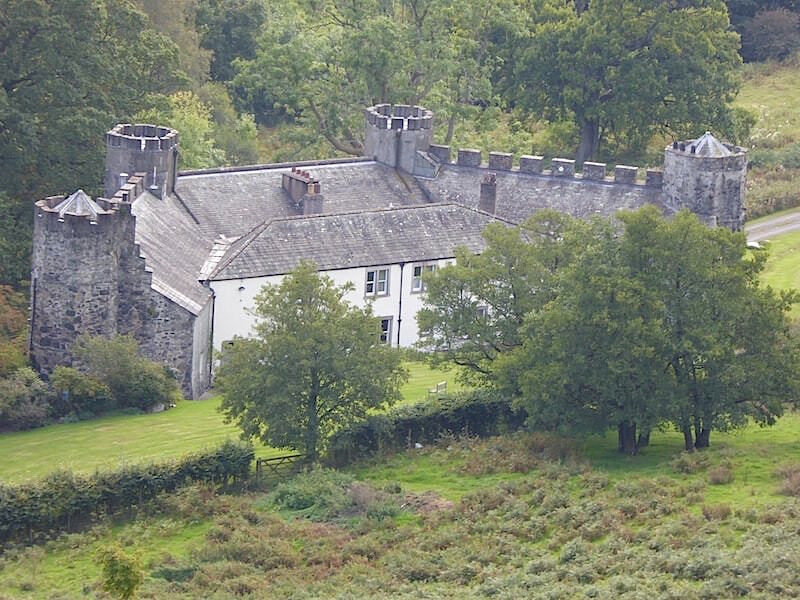 The Howard family, of Greystoke Castle, once owned this former hunting lodge. 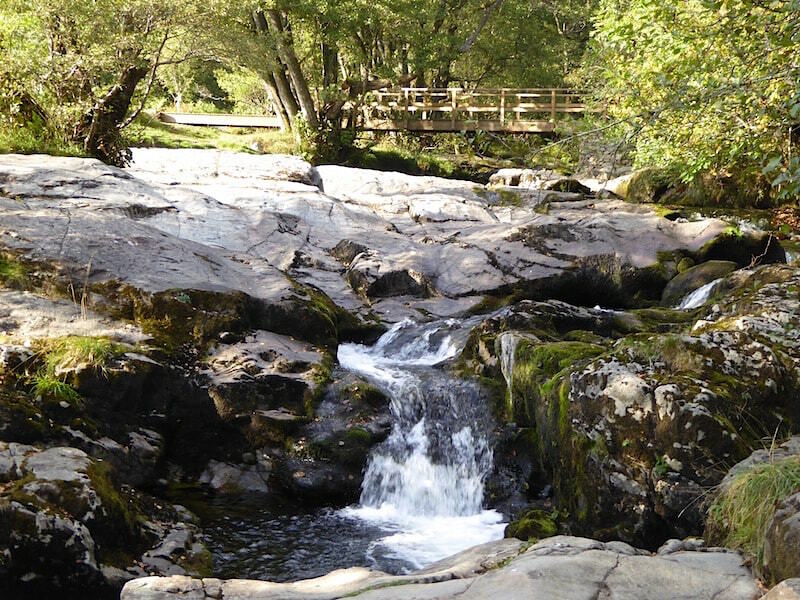 Like many wealthy Victorians, they turned much of their land around Aira Force into a pleasure garden, building bridges and footpaths and an arboretum to entertain, and no doubt impress, their visitors. 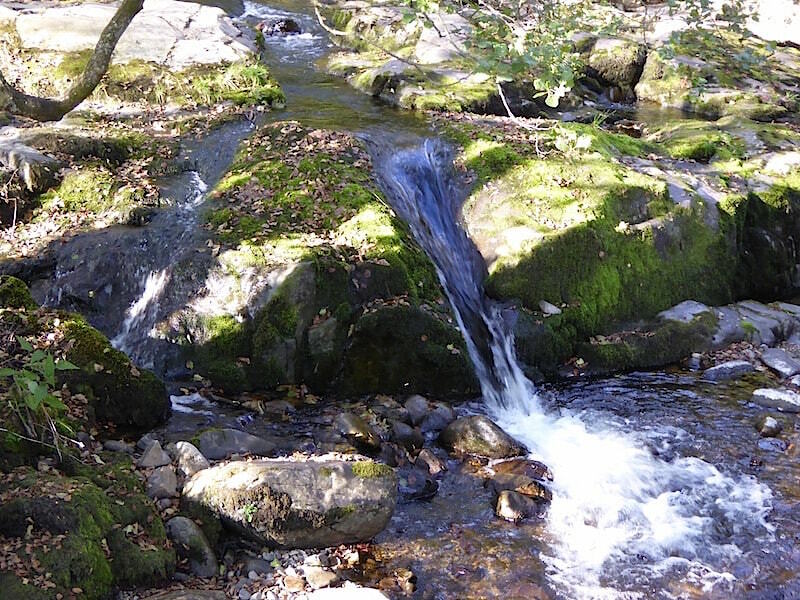 The Aira Force area is now owned by The National Trust so everyone has the chance to enjoy it. 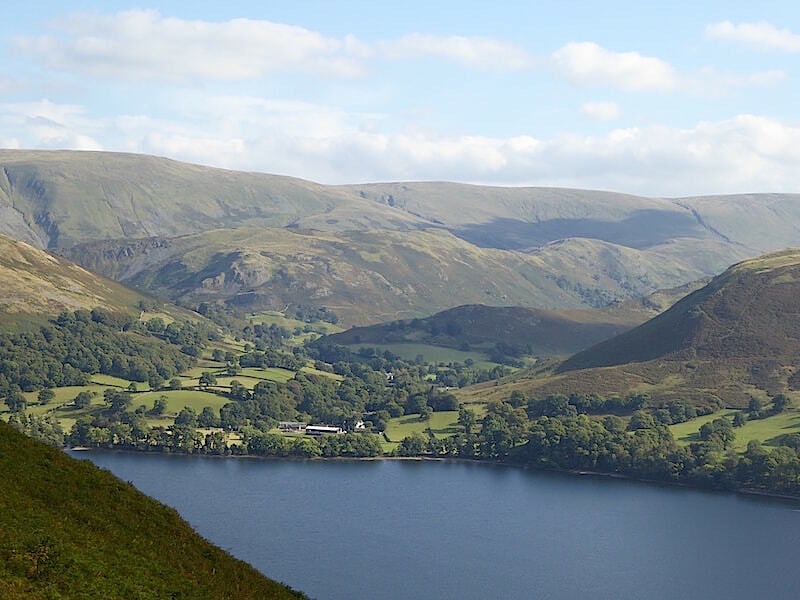 A closer look at some of the Far Eastern Fells. 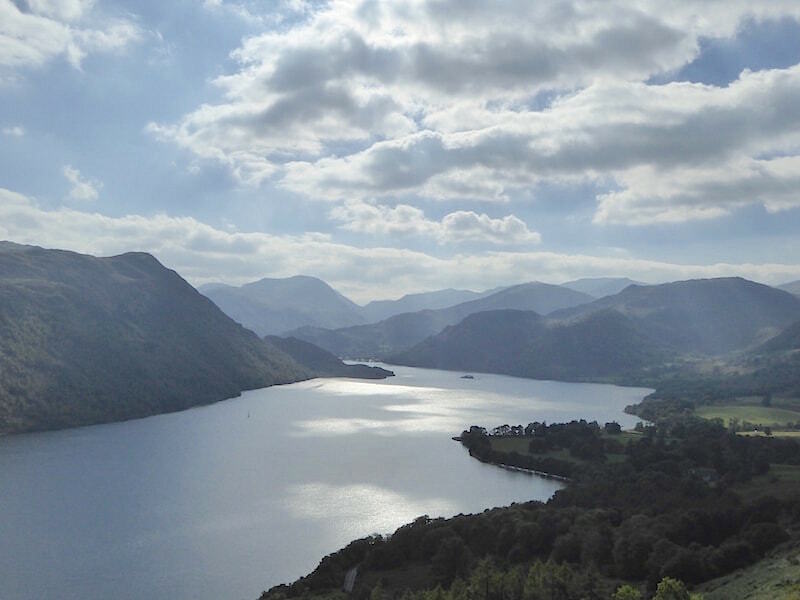 Sunshine and shadows over Ullswater. The Yew Crag view point along the path to Gowbarrow. 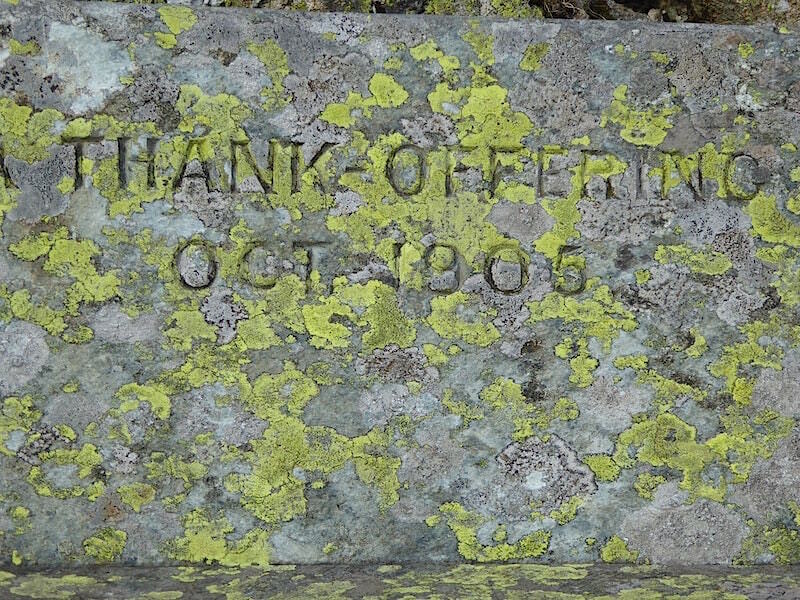 The inscription on the memorial seat close to the viewing point. 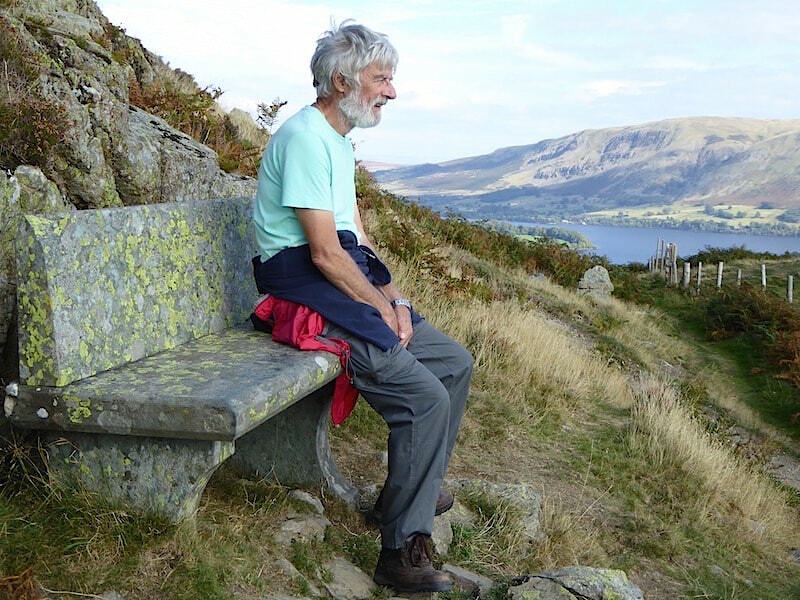 Enjoying the view from the ‘thank-offering’. 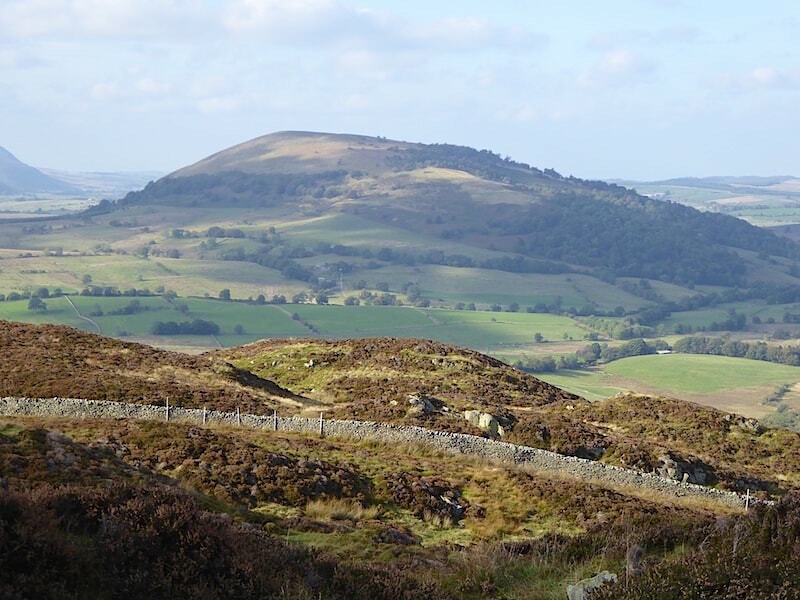 Heughscar Hill, with its familiar topping of trees, in the far distance, and Arthur’s Pike over on the right. 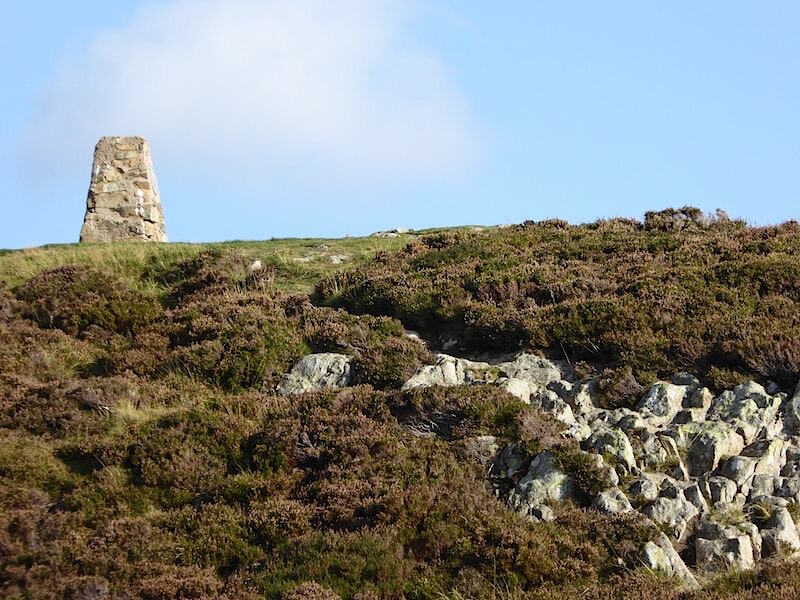 Not much remains of the old shooting hut now and what there is has been taken over by the bracken. You can just about make out the four corners of the building if you look carefully. 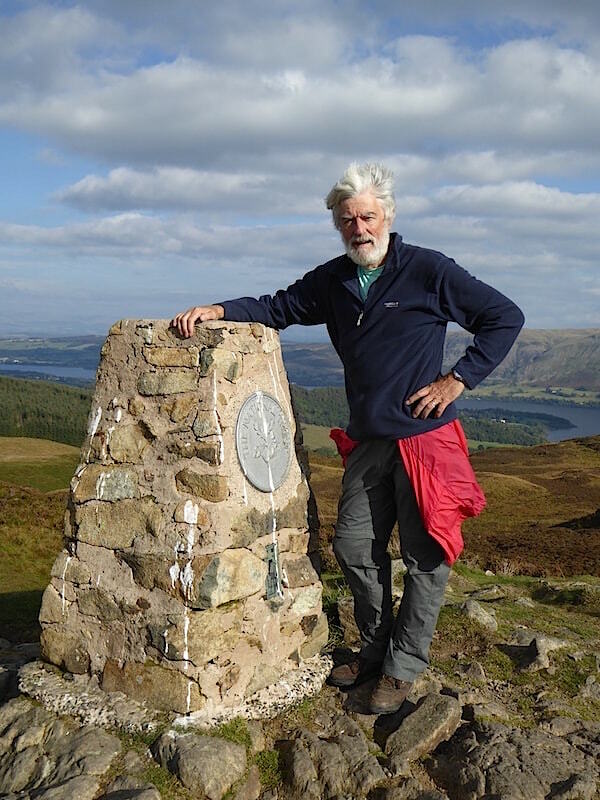 Very windy on the top of Gowbarrow. 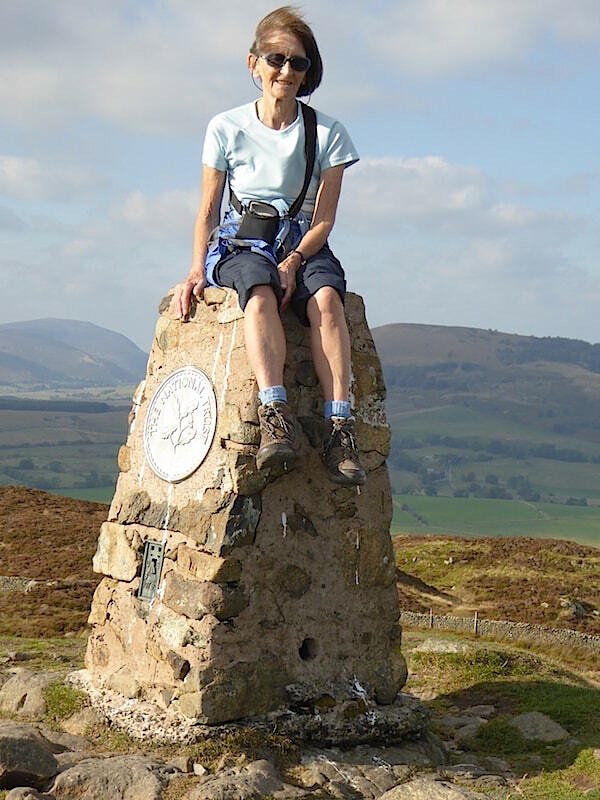 On the summit of Gowbarrow trig point. 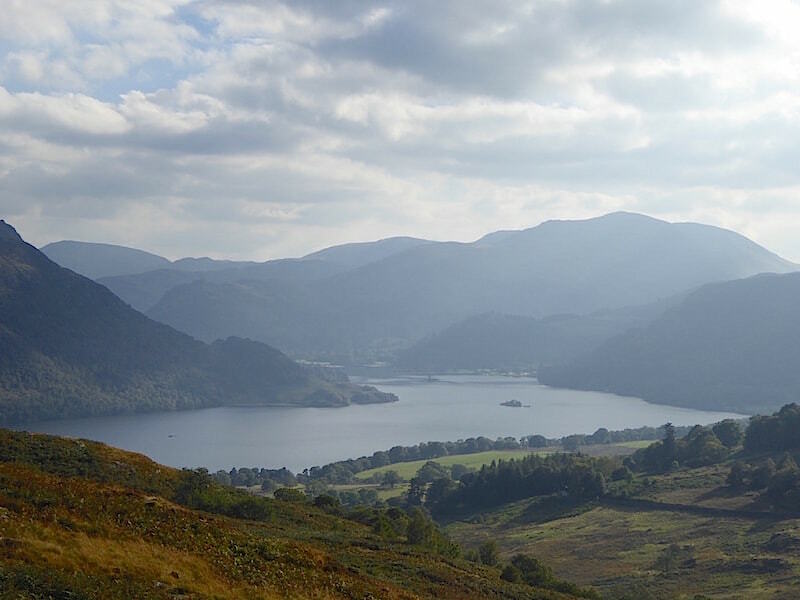 Looking over the northern end of Ullswater from Gowbarrow summit. 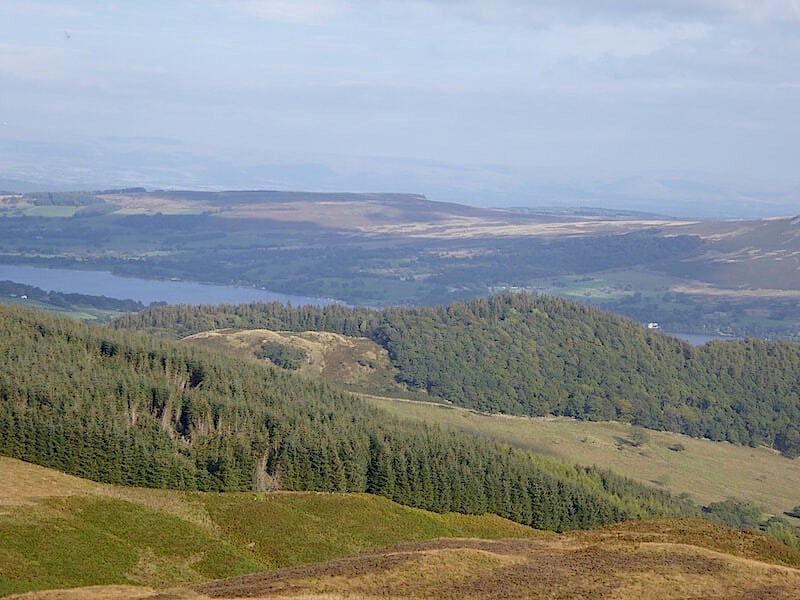 Great Mell Fell from Gowbarrow top. 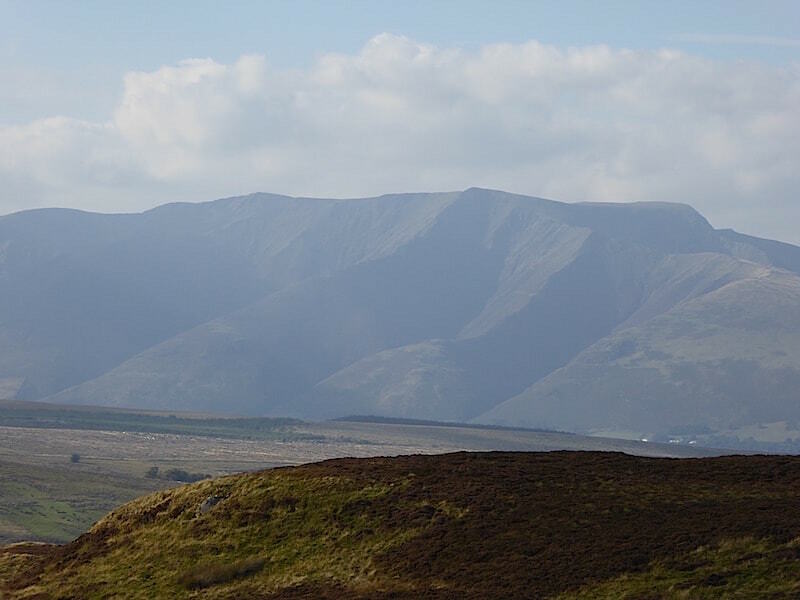 A very hazy Blencathra from Gowbarrow top. 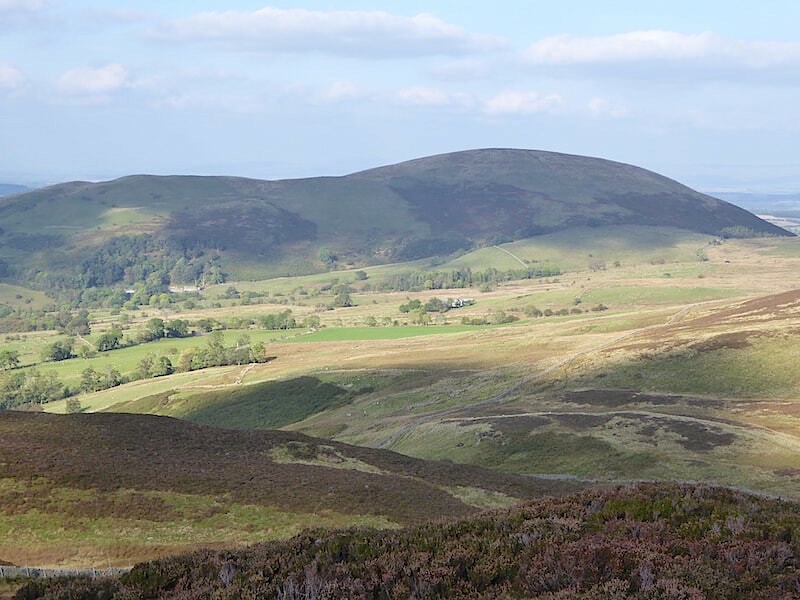 Little Mell Fell from Gowbarrow top. 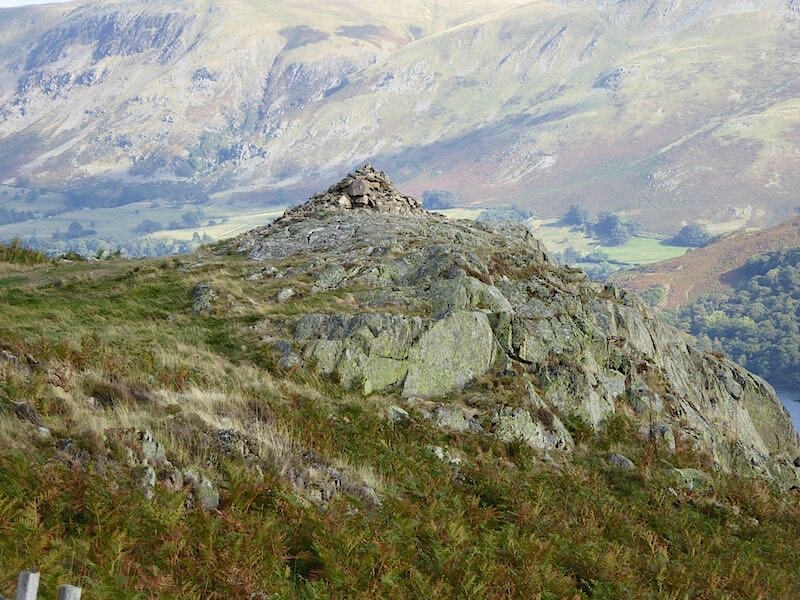 Looking back at Gowbarrow summit. It was too windy to stay any longer so we began to make our way down. 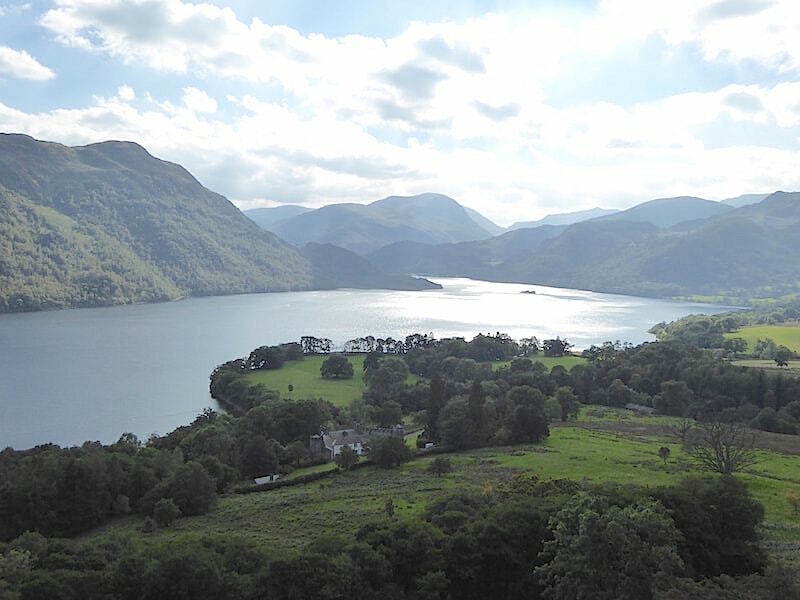 The southern end of Ullswater as we leave Gowbarrow. Our return path eventually brings us out at the upper falls in Aira Beck, there’s less water flowing than usual as we still haven’t had any rain lately. 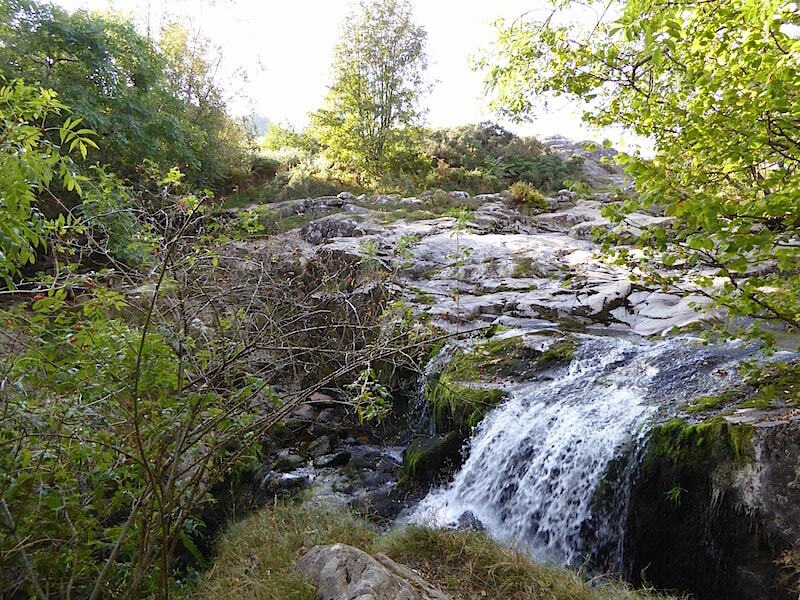 One of the many falls in Aira Beck. More falls lower down Aira Beck, all of them were looking a bit feeble today. 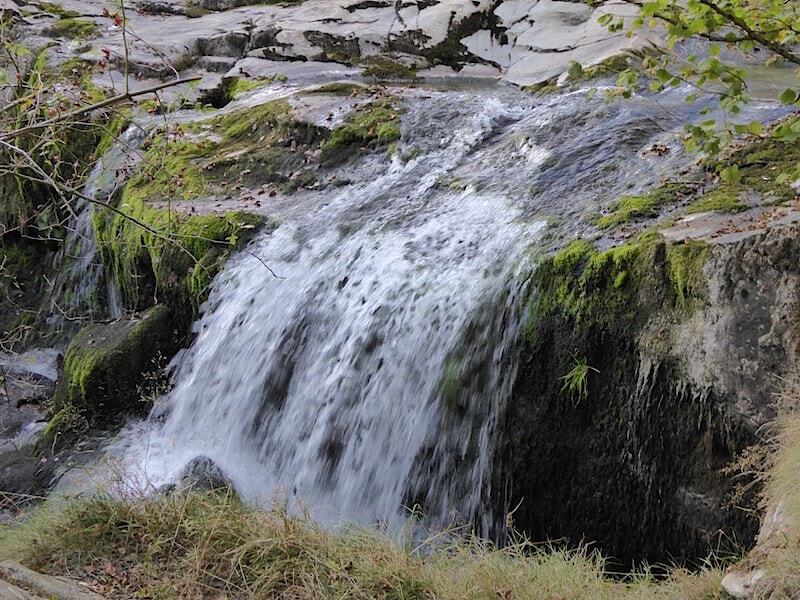 A close up of one of the falls …..
….. and not so close up, all these rocks would usually be covered with water. 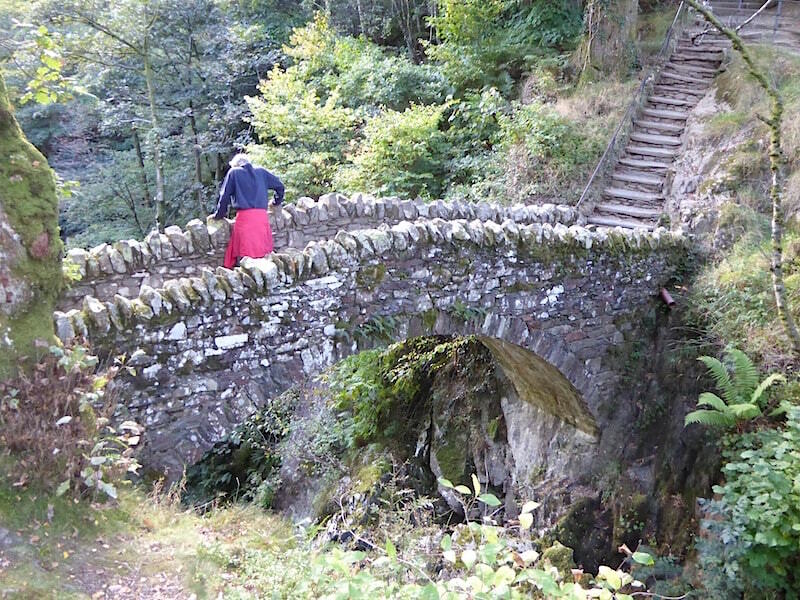 The upper stone bridge over Aira Force. 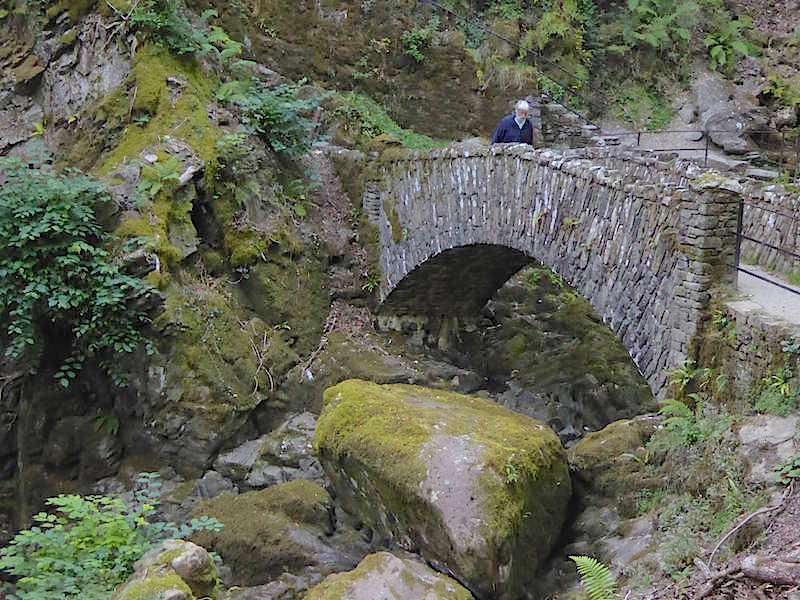 The lower stone bridge at Aira Force. 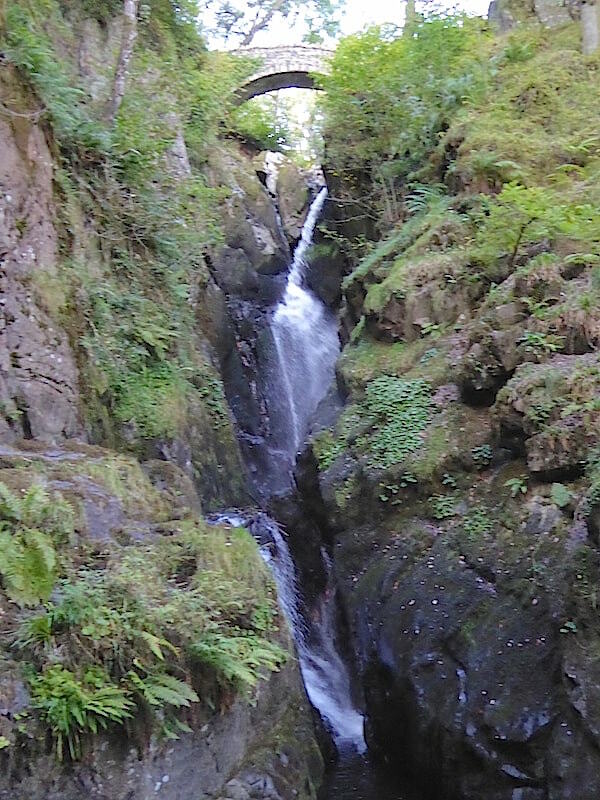 Aira Force, although its more of a trickle today, from the lower bridge. 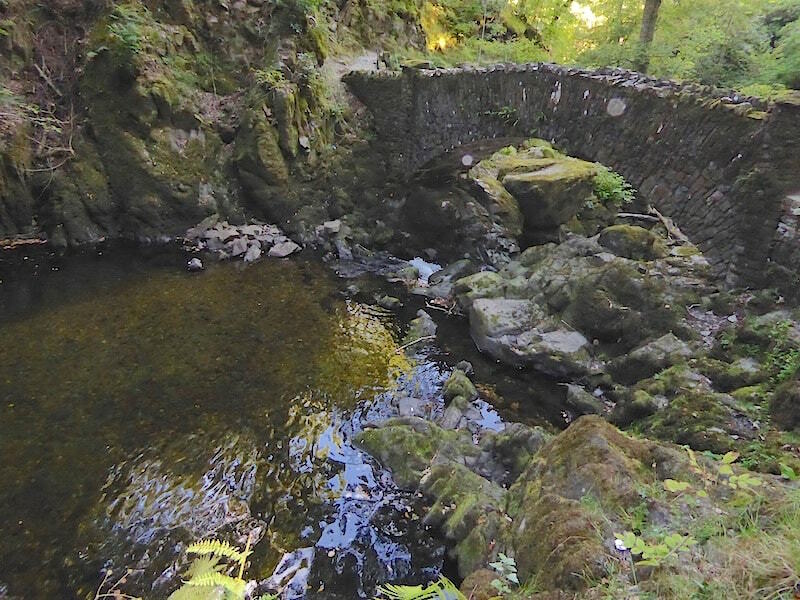 The water from the Force drops into this pool, flows under the bridge and continues down the ravine, eventually flowing beneath the A592 into Ullswater. This a view of the lower bridge from the other side, its always a bit dark here especially when the trees are in leaf. 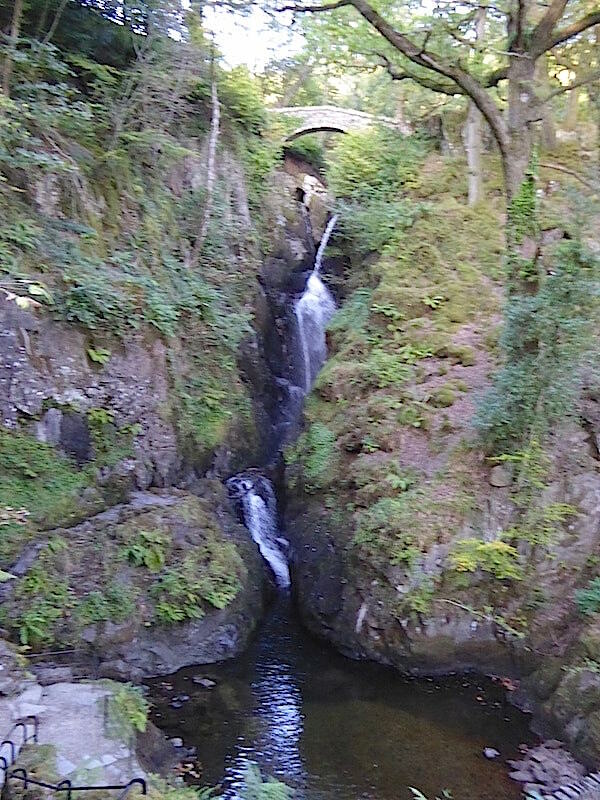 Finally a view of Aira Force, the upper bridge and the pool below. From here it was just a case of retracing our earlier steps along the woodland path back to where the car was parked. 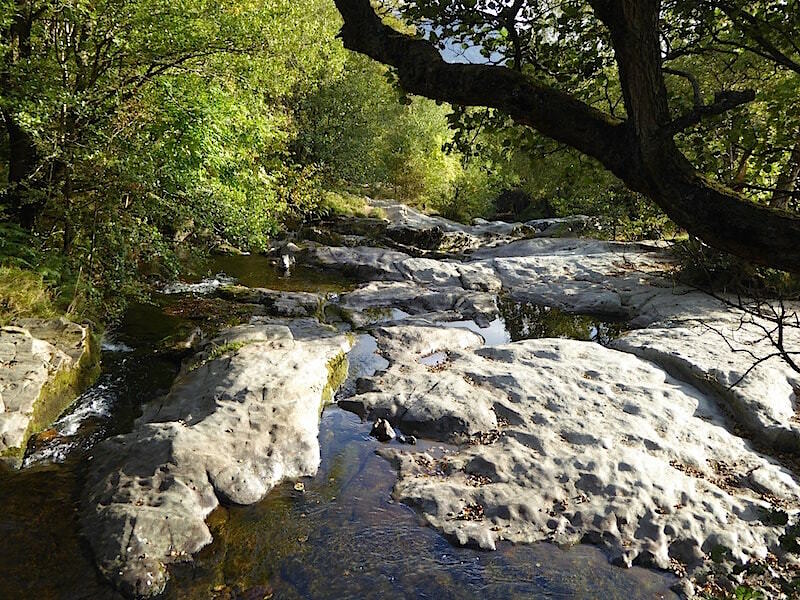 This is a great little walk if you only have a couple of hours to spare, especially the walks along either side of the beck where you need sturdy footwear, flip flops and high heels should be left at home.